People who love fishing are always looking for different ways to improve their experience, whether that involves equipment, technique or environmental elements that impact the process. According to the experts at FishingLicense.org, one thing to consider, is the time when you go out to fish. Surprisingly, there are many advantages to night fishing, and the reasons listed below are certainly worth your consideration. Having too many people around you can be a major inconvenience when you go fishing. A crowd of fishers standing in the same spot means that everyone is baiting the same fish. However, according to the team at FishingLicense.org, this is not as big of an issue when you fish at night, because a lot less people are inclined to practice night fishing in comparison to day fishing. Having less competition around you is, on its own, a significant reason why you should try fishing at night. 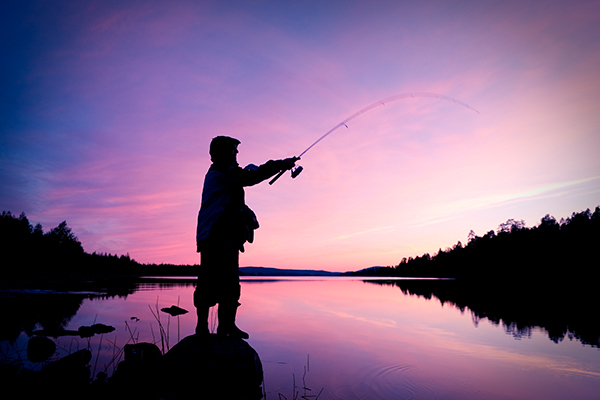 According to FishingLicense.org experts and longtime fishers, the odds of you catching bigger fish at night is considerably greater than during the day. Many specialists argue that some species of big fish are sensitive to light, and stay away from the shore for most of the day. Other species of big fish simply choose nighttime to feed in the shallow waters. In either of these cases, you increase your chances of catching bigger fish, if you go fishing at night. If most of your experience fishing is during the day, night fishing may also provide you with higher chances of catch fish you have never caught before. Especially during summertime, fishing during the day can be a brutal task. If you live in a region where it is only cold for a short amount of time during any given year, then this logic applies not only during the summer, but in every season. Night fishing will help alleviate this problem, because as the sun sets, temperatures decrease, making your finishing experience more comfortable. The team at FishingLicense.org notes that fishing at night will provide less sun exposure, comparison to fishing during the day, which is great news for those who are particularly sensitive to the sun’s UV light. If you are fishing on a boat and are trying to beat high winds, it is a significant advantage to fish at a time when the wind is less severe. The experts at FishingLicense.org advice night fishing to avoid the likelihood of wind speeds that can disrupt your experience. This means that the water will be much calmer, your boat will be much steadier and you are more likely to catch fish. This tip is particularly helpful if you live in a windy region.